Do you love animals? Do you like to learn new animal facts? Do you enjoy solving mysteries? Then you’ll want to be a Vet Cadet! Vet Cadets is an exciting new four book series for smart, animal and science-loving kids who aren’t afraid to get their hands dirty! Hi! I’m Juliet. I’m ten years old. And I’m nearly a vet! 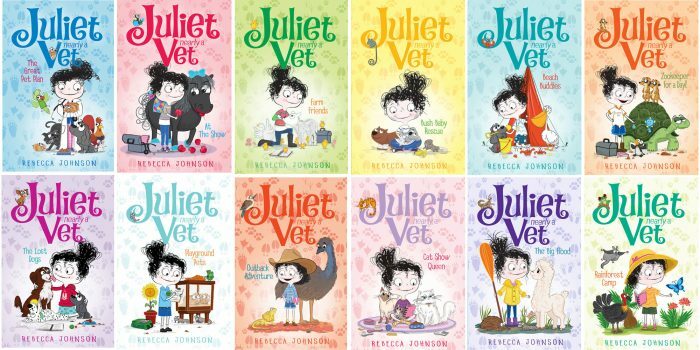 Published by Penguin, ‘Juliet – Nearly a Vet’ is a fun series about a ten-year-old girl who thinks she is almost a vet. Her mother is a vet and Juliet watches her all the time, and there really isn’t that much to it! These books have been designed to give children a clear understanding of the six main groups of animals. They include the features and characteristics that are used to classify animals that belong to each group. The structure of the books allows for easy cross checking, contrasting and comparison between animal groups, making them suitable as a research tool and for direct teaching situations. The Steve Parish Reptiles & Amphibians Story Book range is a fiction series with stunning photographs highlighting the importance of reptiles in our ecosystems and the features they have to enable them to adapt to a variety of environments. The Insect Series focuses on metamorphosis, survival, adaptations, properties of natural materials and the usefulness of insects through fiction stories with stunning close-up photos of insects of all kinds. These books won the 2014 Whitley Award for Best Educational Series and have strong listed links to the Australian Curriculum for many year levels. The Steve Parish Story Book Collection (now published by Pascal Press) and featuring Australian wildlife, combines full-colour photographs by award-winning photographer Steve Parish with fact-filled fiction stories. The Steve Parish Story Book collection has been extremely popular, with over 3 000 000 books sold.